These Hidden Hands is the collaboration between CLR’s Tommy Four Seven and Berlin sound engineer Alain. After the release of their self-titled album earlier this September, which also marked the second issue from their Hidden Hundred label, it was clear that the duo formed the project to put out serious and immersive techno. With enough time for us to replay and reconsider the musical creations these two guys put out, we now get the first series of remixes that steer the tracks to far-off dimensions. While “Kheium” gets remixed in a similar THH fashion, SHXCXCHCXSH provide us with what could also be described as the continuing phase to the original. Similarly daunting and even more obscured this time around, the dark industrial feels will be a set regular for those who want a controlling grip on the floor. 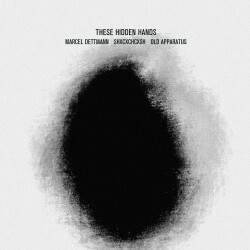 Easier on the ears is Marcel Dettmann’s take on “Laika”. Softening the stomach-churning harshness of the original, the loopy mesmeric essence of the track discloses a wonderful lo-fi space. Lo-fi shifts into dark melancholia as audio/visual collective Old Apparatus rework “Hidden” into a theatrical soundscape that’ll leave you with goosebumps at the very least. An aftermathic tone of apocalyptic dystopia lingers throughout here, both contemplative and complex.